Man sleeps on the street, something anti-homelessness legislation seeks to regulate. Anti-homelessness legislation can take two forms; legislation that aims to help and re-house homeless people, and legislation that is intended to send the homeless to homeless shelters compulsively, or criminalize homelessness and begging. Since the publication of the Universal Declaration of Human Rights (Charter of the United Nations — UN) in 1948, the public perception has been increasingly changing to a focus on the human right to housing, travel and migration as a part of individual self-determination rather than the human condition. The Declaration, an international law reinforcement of the Nuremberg Trial Judgements, upholds the rights of one nation to intervene in the affairs of another if said nation is abusing its citizens, and rose out of a 1939–1945 World War II Atlantic environment of extreme split between "haves" and "have nots." Article 6 of the 1998 Declaration of Human Duties and Responsibilities declares that members of the global community have individual and collective duties and responsibilities to take appropriate action to prevent the commission gross or systematic human rights abuses. The modern study of homeless phenomena is most frequently seen in this historical context. Laws supporting homeless people generally place obligations on the state to support or house homeless people. The 1834 Poor Law Amendment Act required parish unions to supply houses for workers but these unions purposely made these work houses unattractive in order to discourage workers from applying for housing. This Act also made casual wards known as "spikes" available for thoses who needed temporary housing in return for their labor. It was estimated that approximately 30,000 to 80,000 people used the spikes in the early 1900s in Great Britain. The Homelessness etc. (Scotland) Act 2003 was legislation passed by the Scottish Parliament that set the goal of providing permanent residence to those deemed unintentionally homeless. 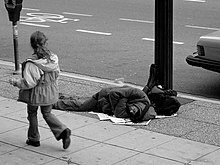 Following, the Homeless Persons (Unsuitable Accommodation) (Scotland) Order 2004 was passed in 2004. This order made it so that, unless exceptional circumstances were present, any familial unit including children or an expectant mother was not placed in "unsuitable temporary housing". Scotland's most recent anti-homelessness legislation is entitled The Housing Support Services (Homelessness)(Scotland) Regulations 2012, and it came into full effect on June 1, 2013. These regulations require local authorities to assist the homeless in a variety of ways, including help in adjusting to a new living situation, debt counseling and managing a personal budget. The first, and primary, anti-homelessness act passed in the United States is entitled the McKinney–Vento Homeless Assistance Act. This act was originally passed in 1987, and has subsequently been amended four times. The 1988 amendment to the act focused on revising the way in which the funds of the McKinney–Vento Homeless Assistance Act were distributed. The following amendment in 1990 established new programs, including the Shelter Care Plus Program, whose focus was in assisting those with disabilities through housing support. There were a variety of additions due to the 1992 amendments, including the implementation of "safe havens" which would allow those whom do not wish to participate in the services offered to receive low cost housing. Another primary change created by the amendments of 1992 was the creation of the Access to Community Care and Effective Services and Support program (or ACCESS); this program was created in order to assist the homeless people who had both serious mental illness issues, as well as substance abuse problems and lasted a total of 5 years. The final amendment to the McKinney–Vento Homeless Assistance Act occurred in 1994, and it specified the amendment of the Surplus Property Program and the Education of the Homeless Children and Youth program. The Fair Housing Act passed in 1968 was designed to protect those who were traditionally discriminated against by housing agencies because of their race, gender, religion, familial status, and disability. Some states and cities also gave homeless people equal access to housing accommodations regardless of their income. Although this Act did not specifically refer to the homeless population, the main beneficiaries of this law were homeless individuals. The Americans with Disabilities Act of 1990, also known as the ADA states that people with disabilities must be given appropriate housing accommodations that meet their special needs. Additionally, people with disabilities should be given the chance to interact with people who do not have disability. This Act ensures that homeless individuals are not discriminated against because of their special needs. The 1977 Housing (Homeless Persons) Act greatly restricted the homeless housing requirements so that only individuals who were affected by natural disasters could receive housing accommodations from the local authorities. This led to the rejection of the majority of homeless applications received by the local government. This Act also made it difficult for homeless individuals without children to receive accommodations provided by local authorities. The National Coalition for the Homeless reports that there is a growing trend in the United States towards criminalizing the state of being homeless. Proponents of this approach believe that punitive measures will deter people from choosing to be homeless. To this end, cities across the country increasingly outlaw activities such as sleeping, eating, sitting, and begging in public spaces, and selectively enforce more neutral laws—such as those prohibiting open containers or loitering—against homeless populations. Violators of such laws typically incur criminal penalties, which result in fines and/or incarceration. In Jones v. City of Los Angeles, the United States Court of Appeals for the Ninth Circuit held that "the Eighth Amendment prohibits the City from punishing involuntary sitting, lying, or sleeping on public sidewalks that is an unavoidable consequence of being human and homeless without shelter in the City of Los Angeles". However on October 15, 2007, the Court vacated its opinion after the parties settled the case and sought withdrawal of the Opinion. Critics of homeless criminalization claim that such measures do nothing to actually solve homelessness and in fact make matters worse. Homeless people find it harder to secure employment, housing, or federal benefits with a criminal record, and therefore penalizing the act of being homeless makes exiting such a situation much more difficult. Although the court's opinion in Jones v. City of Los Angeles (see above) was vacated, the result suggests that criminalizing homelessness may be unconstitutional. Similarly, in response to growing reports of hate crimes, some state governments have proposed the addition of "people experiencing homelessness" to their hate-crimes statutes. The authors of a 2017 study on homelessness stated that homeless people have a higher incidence of sickness, with their most common health problem being skin problems. Homeless people also have a lack of access to sanitation, leading to poor hygiene. These characteristics are noticeable and may trigger reactions of disgust from onlookers who are inclined, at an evolutionary level, to be pathogen-averse. This leads the general public to keep their physical distance from homeless people, and promotes exclusionary policies. As an example, these authors state that while the majority of the general public support subsidized housing for homeless individuals, they do not want that housing in their own neighborhood. But the public also maintains concern for the homeless, supporting increases in federal spending on homelessness programs. In fact, when surveyed, the public supports spending on homelessness over other social problems by consistently putting the homeless in the top third of their spending priorities. Respondents to surveys also feel that 55% of homeless people are addicted to drugs or alcohol, and that 45% of homeless people have been to jail before. The majority of U.S. residents surveyed also think that homeless people make neighborhood worse, and that their presence brings down the profitability of local businesses. ^ "DECLARATION OF RESPONSIBILITIES AND HUMAN DUTIES". Globalization. 2 (2). November 2002. ^ Lund, Brian (2016). Lund, Brian (ed.). "Housing politics in the United Kingdom". Housing Politics in the United Kingdom. Power, planning and protest (1 ed. ): 207–232. JSTOR j.ctt1t89499.12. ^ a b Kennett, Patricia; Becker, Saul (2003). "Comparing social policies". Comparing Social Policies. Exploring new perspectives in Britain and Japan (1 ed. ): 173–190. JSTOR j.ctt1t89g4j.16. ^ [email protected], Scottish Government, St. Andrew's House, Regent Road, Edinburgh EH1 3DG Tel:0131 556 8400 (2013-06-03). "HOUSING SUPPORT DUTY TO HOMELESS HOUSEHOLDS - GUIDANCE FOR LOCAL AUTHORITIES". www.gov.scot. Retrieved 2017-11-26. ^ a b c McKinney Vento Act (NCH Fact Sheet #18). National Coalition for the Homeless. June 2006. http://www.nationalhomeless.org/publications/facts/McKinney.pdf. ^ "Housing Authority » Shelter Plus Care Program". www.hacsl.org. Retrieved 2017-11-26. ^ Steadman, Henry J.; Cocozza, Joseph J.; Dennis, Deborah L.; Lassiter, Margaret G.; Randolph, Frances L.; Goldman, Howard; Blasinsky, Margaret (2002-07-01). "Successful Program Maintenance When Federal Demonstration Dollars Stop: The Access Program for Homeless Mentally Ill Persons". Administration and Policy in Mental Health and Mental Health Services Research. 29 (6): 481–493. doi:10.1023/A:1020776310331. ISSN 0894-587X. ^ a b c d Homelessness Handbook. Homelessness Handbook (1 ed.). Berkshire. 2007. pp. 291–338. ISBN 9781933782034. JSTOR j.ctt1jd952s.9. ^ a b Amster, Randall (2008). Lost in Space: The Criminalization, Globalization, and Urban Ecology of Homelessness. New York: LFB Scholarly. ISBN 978-1-59332-297-7. OCLC 221150739. ^ Cunningham, Kelly (1999). Out of Sight—Out of Mind?. DIANE Publishing. p. 90. ISBN 978-0-7881-8276-1. ^ a b Becker, Saul (2017). Lund, Brian (ed.). "Understanding housing policy (third edition)". Understanding Housing Policy (Third Edition) (REV - Revised, 3 ed. ): 155–178. JSTOR j.ctt1t89dc6.14. ^ Lichtblau, Eric. "Attacks on Homeless Bring Push on Hate Crime Laws". Retrieved 2018-06-15. ^ Clifford, Scott; Piston, Spencer (2017-06-01). "Explaining Public Support for Counterproductive Homelessness Policy: The Role of Disgust". Political Behavior. 39 (2): 503–525. doi:10.1007/s11109-016-9366-4. hdl:2144/31477. ISSN 0190-9320. Constitutional Problems with Criminalization Measures National Law Center on Homelessness and Poverty.